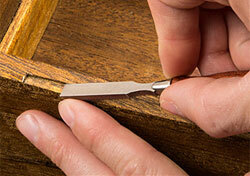 This chisel set is a new addition to the Veritas line of fully functional miniature tools. 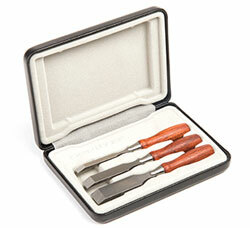 Made at about 1/3 the scale of the regular bench chisels, each is only about 83 mm (3-1/4 inch) long overall and weighs less than 10 g. At this scale, the three tools in the set have 9.5 mm (3/8 inch), 6.3 mm (1/4 inch) and 3 mm (1/8 inch) wide blades. All permit a delicate touch where fine, controlled cuts are needed. Their 2.4 mm (3/32 inch) thick PM-V11 steel blades are hardened to Rc61-63 and ground flat on the face. They have a 25° bevel. 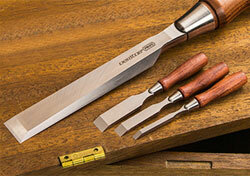 The chisel handles are bubinga with a stainless-steel ferrule. See the video on youtube This item we ship only within the European Union!